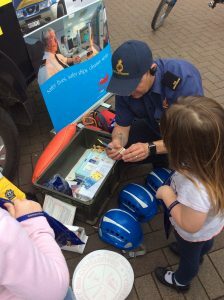 Not long now until this years’ annual event, which will take place on Saturday 27th April 2019, 11am-2pm in Lawrence Square and the High Street, Gosport. Some popular faces will be once again be returning including GAFIRS, HM Coastguard, Hampshire & Isle of Wight Air Ambulance, Hampshire Fire & Rescue and SERV Wessex. Free cycle coding will be available at the event on a ‘first come, first served’ basis, along with a limited amount of ‘D’ Locks available to purchase at a discounted price. Appearences by mascots including Chase from Paw Patrol will feature at regular intervals and a range of local organisations will be providing advice and information such as Citizens Advice Bureau, Victim Support, School Nursing Team and Hampshire Connect to Support Service. You will also be able to find out how to sign up to the local Speedwatch campaign or learn how CPR is carried out through demonstrations by local Community First Responders. 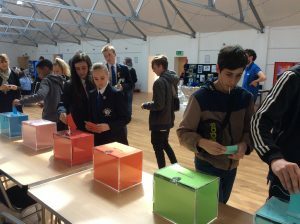 A special opportunity to get involved in local decision making will feature for the first time this year, with the YOUdecide voting event being included in the day’s programme. Gosport residents, and young people particularly, are encouraged to come along and take part in deciding which of five finalists should be awarded a share of £10,000. The project displays will be located in the Town Hall reception and you can find more information about this on the Youth YOUdecide page. 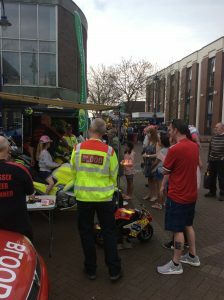 Whilst the sun only made a brief appearance on the day, it failed to dampen the spirit of the 2018 Safer Gosport Community Day! Residents were welcomed by a whole host of local organisations in Lawrence Square on Saturday 21st April. 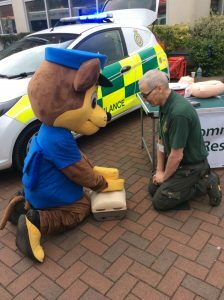 Age was no barrier to learning new skills, with many residents young and old alike learning life saving skills with the Community First Responders team…even Paw Patrol got in on the action! 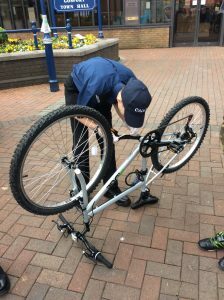 Lots of residents took up the offer of free cycle coding, which was carried out by the Hampshire Police Cadet members.